New Free Studio Manager is a completely redesigned all-in-one package for our programs. 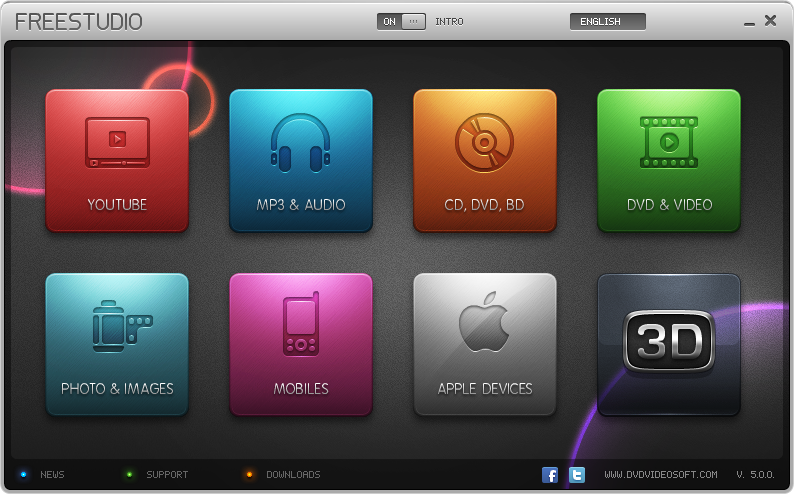 Free Studio contains 8 sections to bundle all free multimedia applications which have been developed by DVDVideoSoft. The sections are: YouTube, MP3&Audio, CD-DVD-BD, DVD&Video, Photo&Images, Mobiles, Apple Devices, 3D. Thus all the programs are included in the new interface for easy access to any of them. ...... popular mobile phones and devices; burn and rip DVDs and audio CDs; upload and download YouTube videos and music to your computer, iPod, PSP, iPhone and BlackBerry; perform basic editing of audio and video files as well as record videos and make snapshots. AutoCAD drawing file viewer , browser and Print. Mixman StudioPro(TM):Create original music.Perform live. Phat loops. Scratching. Qweas is providing links to Free Studio 5.3.5 as a courtesy, and makes no representations regarding Free Studio or any other applications or any information related thereto. Any questions, complaints or claims regarding this application Free Studio 5.3.5 must be directed to the appropriate software vendor. You may click the publisher link of Free Studio on the top of this page to get more details about the vendor.